Just over a year ago, I noticed the local climbing gym was offering a women’s bouldering class and — on a whim — I signed up. I truly don’t know what got into me. Signing up for new experiences and following through on trying new things and meeting new people isn’t exactly in my wheelhouse. But I’d always thought climbing looked cool and this seemed like the perfect opportunity to try it. The first session was humbling. I made it up the wall about 6 feet but couldn’t get any farther. After just a few tries, I was physically spent. I was physically spent but mentally intrigued. Over time and with plenty of practice, I got better. I even took 3rd place in my division in our bouldering competition back in March. 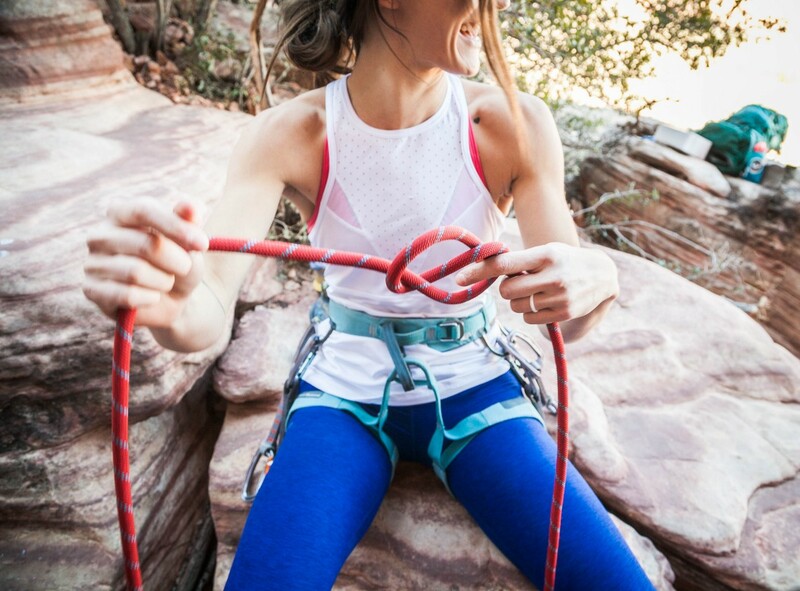 When you first start climbing, you assume that getting stronger is what makes you a better climber. But strength is only a small part of the equation. Instead, great climbers are really good at “reading the route” and figuring out the most efficient pattern for climbing a series of holds as effortlessly as possible. That pattern is called your beta. Everyone’s beta can be a little different. For instance, since I’m on the shorter side, I often have to climb things a little differently than my taller climbing friends. In bouldering — the discipline of the sport that I’m currently interested in — the climbing routes are called “problems.” Your beta is how you solve the problem. Bouldering is every bit as much a mental sport as it is a physical sport. Your goal is to work it out and then perform it (ideally, at the same time). Once you’ve unlocked your beta on a problem, it can seem downright easy to climb, even if it felt impossible the day before. Now that often means that you run into people at the gym who are struggling on a problem that you’ve already solved. Sometimes, despite their best efforts, they can’t even get off the ground. Out of empathy for their frustration or because I’m incredibly excited about my own effort to figure out the problem, I am often tempted to rush over and offer a suggestion. One day, I asked my climbing coach how she holds herself back when she sees someone struggling with a climb. She explained that this is a big faux pas in the climbing world. It even has it’s own special name — which is no surprise because climbing is its own language. Spraying beta is offering unsolicited advice on how to climb a route or perform a move. She further explained that the reason it’s so frowned upon is because so much for the fun of bouldering is figuring it out for yourself. When you “spray beta,” you’re robbing that person of the chance to have their own moment of victory. They lose out on the opportunity to connect the dots in their own unique way. Watch a version of this post and some sweet climbing footage. Now, I will totally admit that I’ve been known to spray some beta. But after that conversation, I’ve become much more cautious about when I give advice on how someone should tackle a climb. When I’m climbing with my friends, I ask them for permission before I weigh in on what I did to climb a problem. When I’m climbing with strangers, I let them approach me before offering help. It’s not just in the climbing gym or at the crag that spraying beta is a problem. The whole internet is covered in a thick, sticky film of sprayed beta. Social media has become a place where advice is given whether we want it or not. People build “expert” brands giving advice about what everyone else should do with their romantic relationships, voting choices, lifestyles, fitness programs, or small businesses. Just like I have a history with spraying beta, I have a history with offering unsolicited advice on the internet, too. We all do, right? My ability to climb up a wall using colorful plastic rocks is not the only thing that’s evolved over the last year. As my team and I have been building CoCommercial, a platform for small business owners to work together and get real about what’s really working for them, I’ve adjusted the way I talk about my own experience and observations. I’ve seen that unsolicited advice rarely lands well. No surprise there. But what I really underestimated was the power of sharing personal experiences in a consensual context. When you offer advice and say “here’s what you should do,” you either rob a person of the opportunity to overcome a challenge on their own or you inspire a flight or fight response that sends them in the opposite direction of a great solution. When you say “here’s what worked for me,” your experience becomes a data point that someone can use to figure things out on their own. Their agency and creativity remains in tact. They can actually build off of your experience and find their own tailor-made solution through inspiration not copying. While I won’t tell you what you should do with your hard-won lessons and personal opinions, I will tell you that I, for one, am focused on creating a context of consent and sharing from my own experiences and observations — rather than giving advice — whether I’m at the climbing gym or talking to small business owners at CoCommercial.